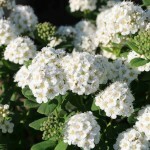 A dense, rounded shrub with flattened round clusters of snow white flowers in spring. The birch-like dark green foliage turns orange, red and purple in the fall. It should be planted in full sun in average, well-drained soils. The flowers occur on new wood; prune late winter to early spring as needed. 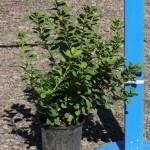 Useful as a specimen, in shrub borders, mass plantings, or as a low hedge.